I’ve been on a cream cleanser binge lately, searching for the perfect moisturizing cleanser for cold winter mornings. A new cleanser I’ve been showing a little love to lately is Marula The Leakey Collection’s Pure Marula Cleansing Lotion. 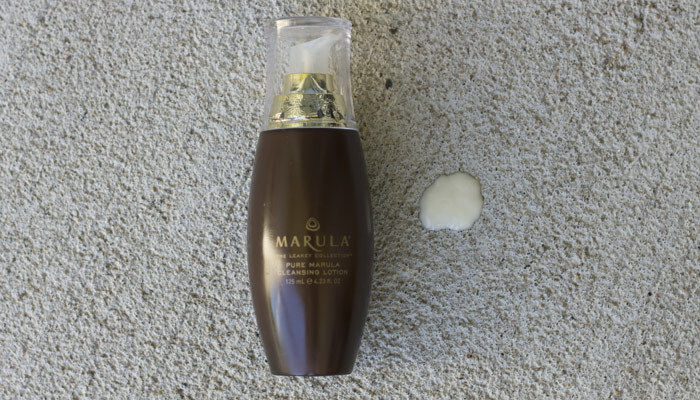 Marula The Leakey Collection’s Pure Marula Cleansing Lotion has virtually no smell and is extremely slippery; it feels like a nicely diluted facial lotion, easy to massage in and oh-so-softening. A peptide derived from hydrolyzed lupine seed extract forms a thin layer on the skin to protect and moisturize it — but there’s no funky residue left behind. Impressive. I use several pumps of this cleansing lotion to get a quarter-sized amount on my palm. Perhaps I’m overdoing it, but we’re talking about 6-7 pumps; the spout of the pump is a bit puny, so I have to be aware of how much product I actually use. From the first application of Marula The Leakey Collection’s Pure Marula Cleansing Lotion, your skin drinks in the benefits of aloe vera and marula oil, which make up the base of this cleanser, while various fruit extracts, such as orange, lemon and blood orange, brighten and tone. Like a lot of cream cleansers I try, this isn’t the most effective at removing everyday makeup. You’ll need to do a deep oil cleanser first and then foam it up to truly cleanse. That’s why I like my cream cleansers for basically clean morning skin — a shot of moisture and sweat removal is what I’m really after here! I switch it up between Marula The Leakey Collection’s Pure Marula Cleansing Lotion and this cleanser during my morning shower, and while the Pure Marula Cleansing Lotion is growing on me, I’m not sure it’s quite worth the $38 price tag. It’s a fine product and isn’t excessively expensive by any means, but I think there are some better buys out there that are loaded with even more exciting ingredients. Have you tried anything from Marula The Leakey Collection? What do you look for in a cream cleanser? Tell me in the comments section!